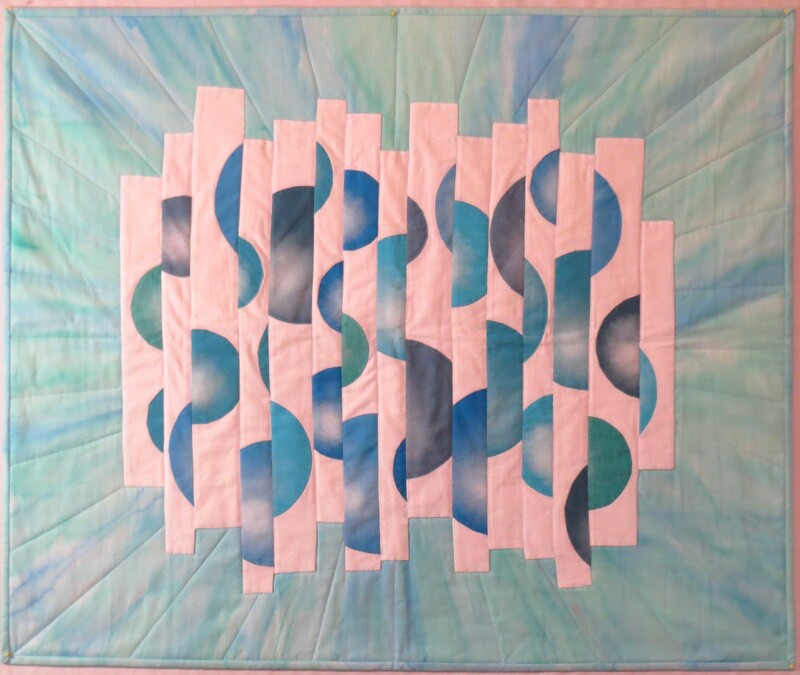 I have completed six quilts in my Working In Series class, and will show all of them in this post. 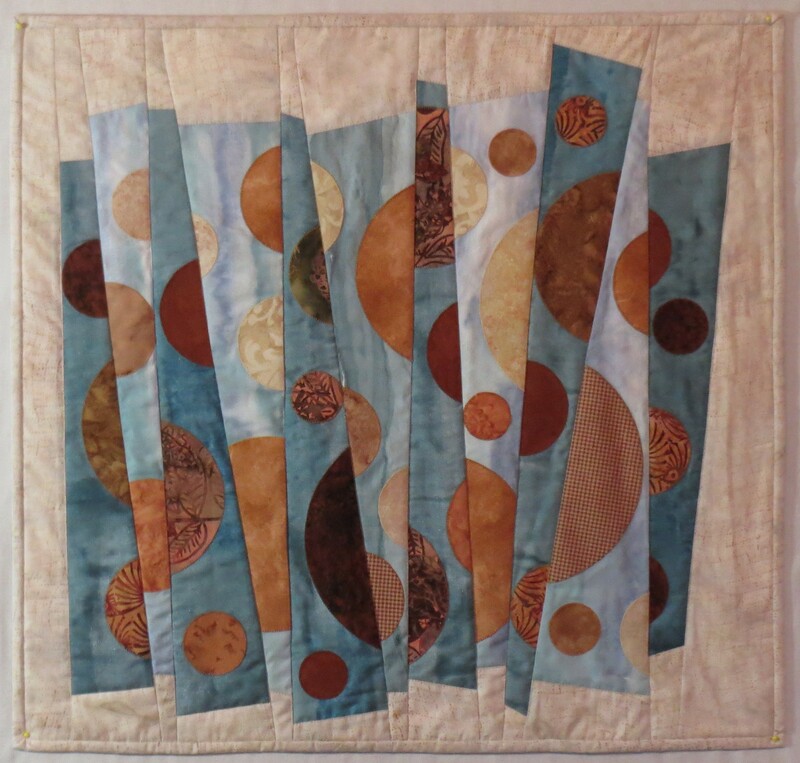 The class was very challenging and I recommend it highly for any of you interested in producing more art quilts. Again, the class is taught by Elizabeth Barton through the Academy of Quilting (www.academyofquilting.com) . Here are the quilts, in the order I completed them. 1. Blue spheres. The background is hand painted. A variety of white on white fabrics were used for the strips. The spheres started with circles in several blue and green fabrics. The shading was produced with a white Paintstik (see earlier post for details). 2. Purple circles. 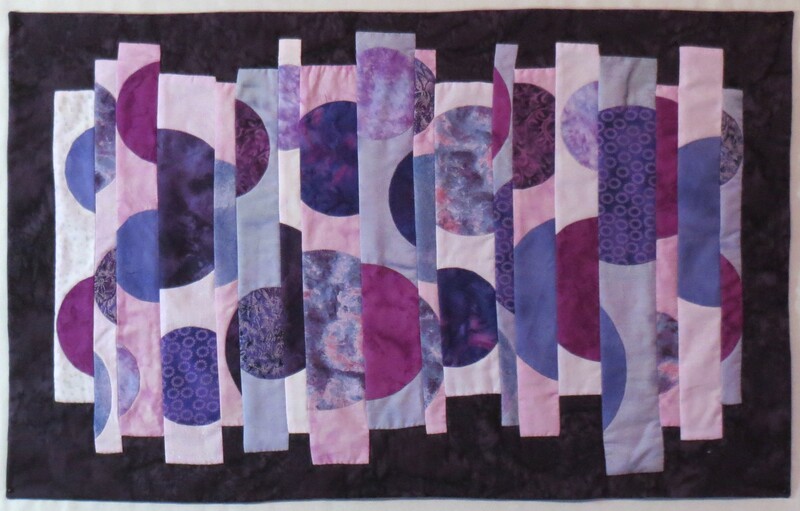 Deep purple background fabric, lavender strips (some hand painted), and a variety of purple circles. 3. Purple circles on yellow strips. Half the yellow strips were painted with a diluted brown paint to darken them slightly to add more depth. The background is dark purple. 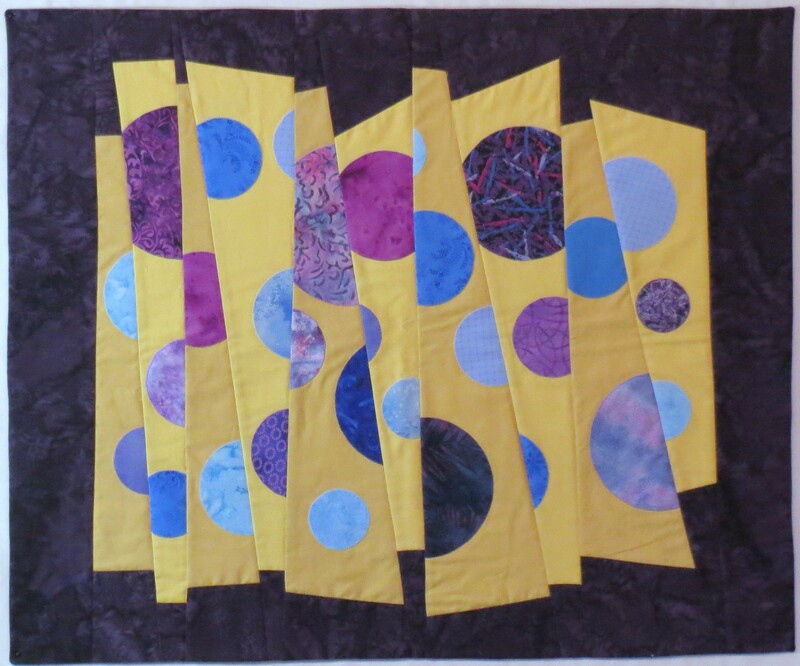 A variety of purple and blue fabrics were used for the circles. 4. Black and white and red. Black background fabric, A variety of black and white prints for the strips. Red-orange circles. 5. Blue, tan, and red. Here circles were cut out of the original circles. I like this idea and want to explore it further. 6. Cream, Blue gray and brown. The blue gray strip fabric was a handpainted piece left over from a previous fabric painting class taught by Michelle Scott. I can think of many ways to explore this theme further, and look forward to doing so in the future. 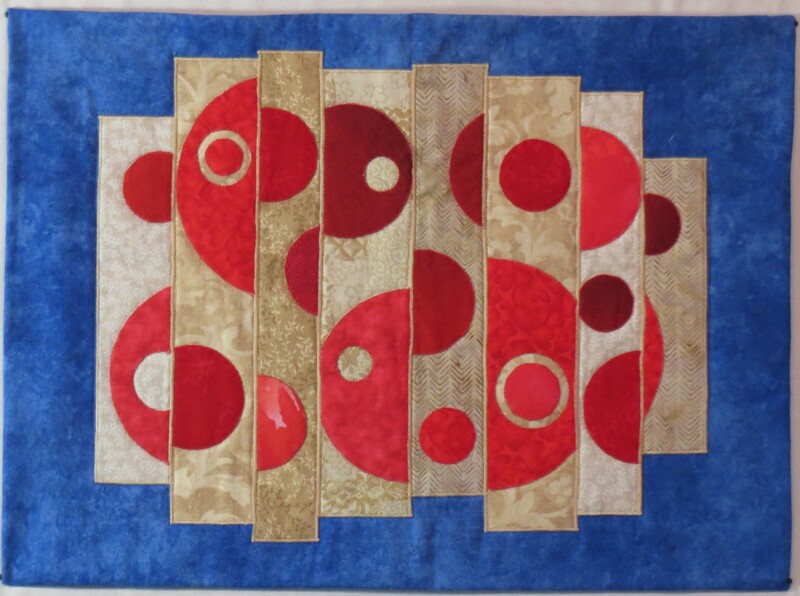 This entry was posted in applique, Art Quilts, Quilting, series quilts and tagged abstract art quilt, Art quilting, art quilts, fractured circle quilt designs, sliced circles on strips on May 30, 2014 by Shirley at Mystery Bay Quilt Design. Wow. 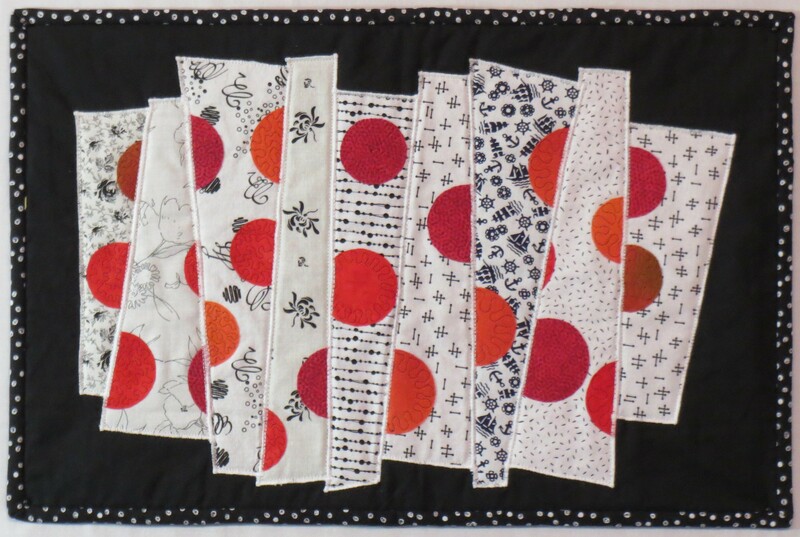 I love the modern kinetic feel these quilts have.